4 Bdrm Upper Self-contained flat on 2 flrs. 1st flr: Hall. Lounge. Dining kitch. 2 Bdrms. Cloakrm with wc. 2nd flr: 2 Bdrms. Bathrm (CT band - E). Garage. Parking. 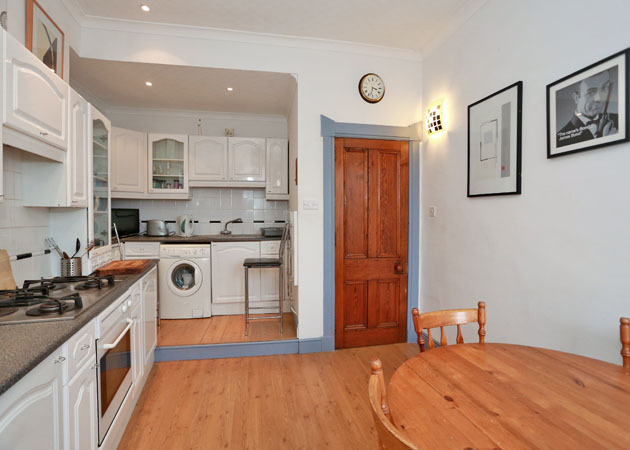 Price over £290,000 Entry by arr. Viewing contact solicitors. (EPC band - E). 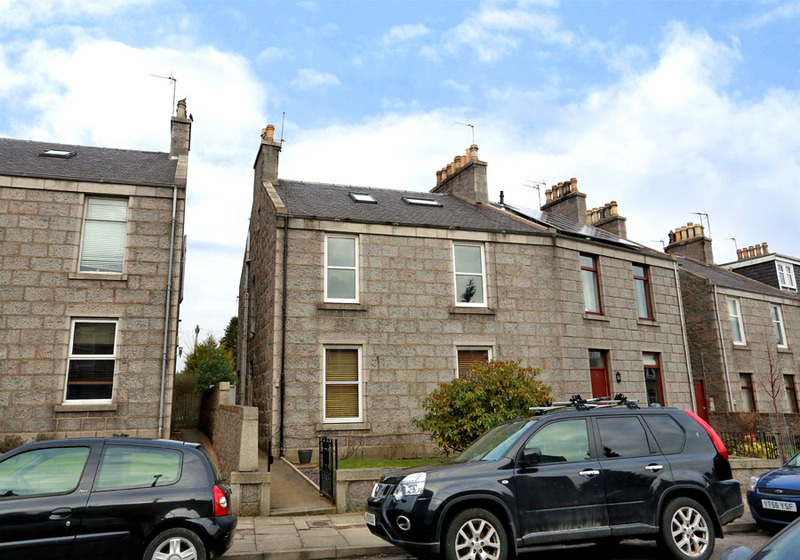 We are delighted to offer for sale this FOUR BEDROOM SELF CONTAINED DOUBLE UPPER FLAT which is ideally situated in a sought after City Centre location. 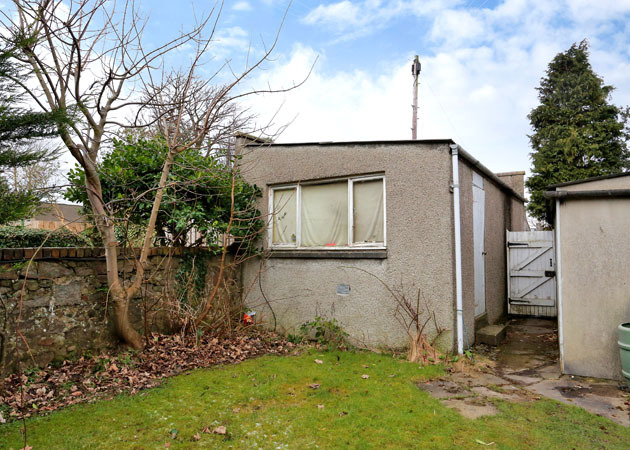 The property would undoubtedly represent an excellent FAMILY HOME or an ideal BUY TO LET opportunity with its well proportioned accommodation and desirable location. 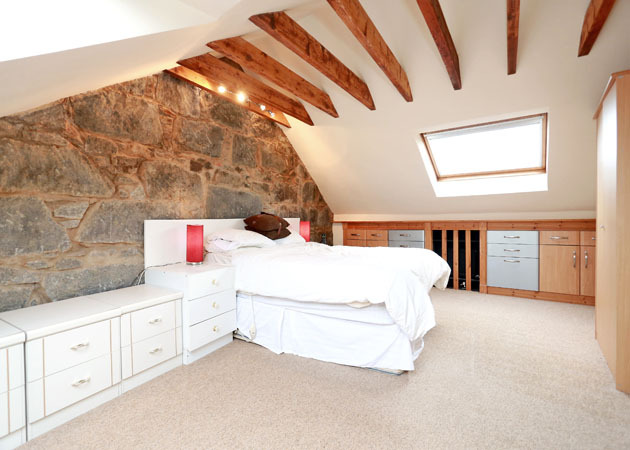 The accommodation comprises Entrance Stairway, Entrance Hallway, Lounge, Dining Kitchen, Four Bedrooms, Bathroom and Cloakroom. 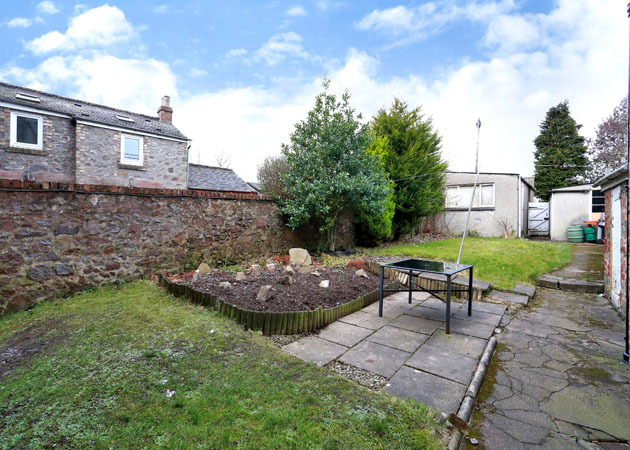 Furthermore the property benefits from a shared Rear Garden with various private storage sheds, one being particularly spacious and with a large Single Garage with automatic door which is also fitted with power and light. 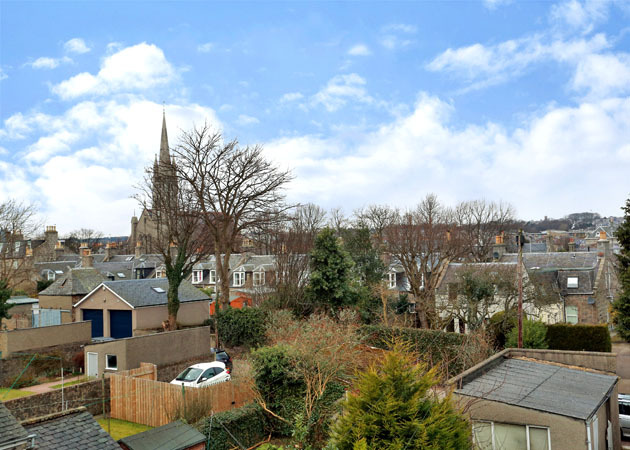 Irvine Place is a quiet West End location situated close to Great Western Road and Holburn Street two of the main arterial routes to the City Centre. Most parts of Aberdeen City are readily accessible by various routes and the area is well served by local shops and by public transport facilities. The nearby Talisman building on Holburn Street is within easy walking distance as is the West End of the City with its pubs, clubs, restaurants, shops and leisure facilities. 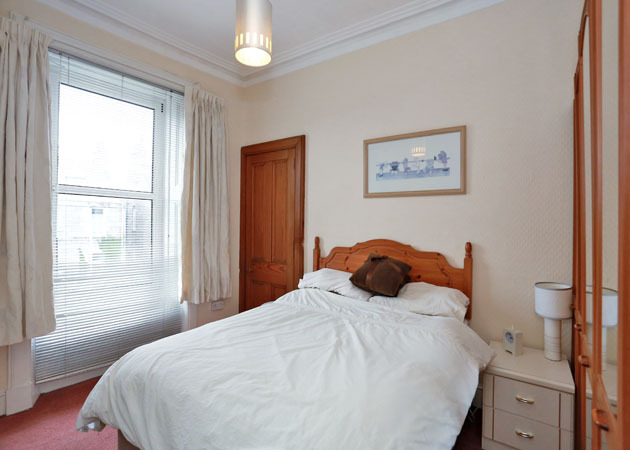 Also nearby is the opportunity to enjoy the many attractions in the Duthie Park and its Winter Gardens and also there is the opportunity for lovely walks along the banks of the River Dee. DIRECTIONS From the west end of Union Street exit left onto Holburn Street. At the traffic lights turn right onto Great Western Road. At the next set of traffic lights turn left onto Holburn Road and Irvine Place is first on the right. ENTRANCE STAIRWAY: Entered through door to the side of the property with carpeted stairway leading up to the first floor. 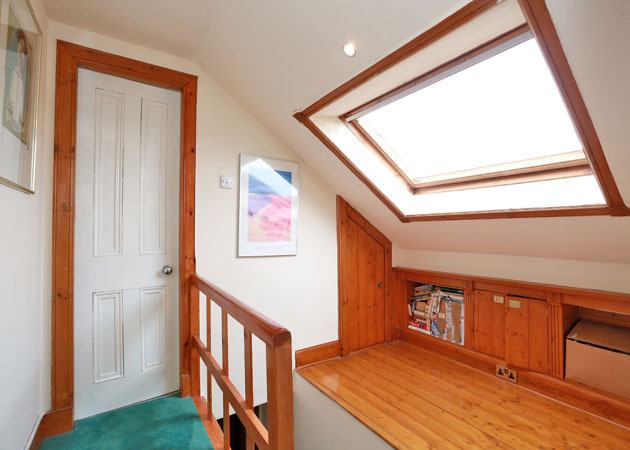 An attractive large coloured glass window to the side providing excellent natural light. HALLWAY: Impressive Hallway providing access to all accommodation on the first floor. Access to stairwell for second floor. Fitted carpet. A focal point is the decorative fireplace with surround and large mirror over the mantel. LOUNGE: 15’7” x 13’6” approx. The spacious and comfortable Lounge benefits from a bright and airy atmosphere created by the large window facing to the front of the property filling the room with natural light. 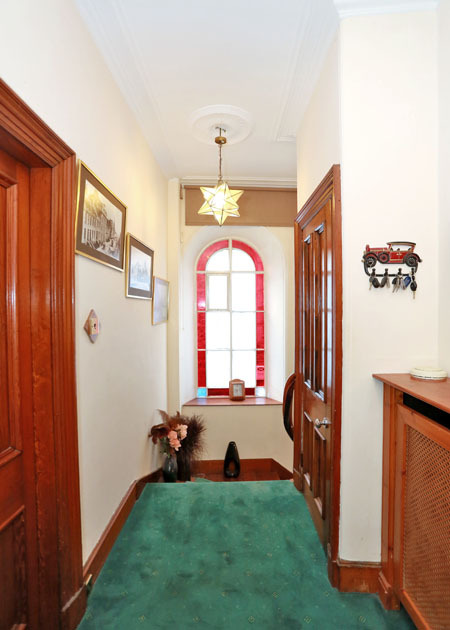 Deep wooden skirting boards, wooden window shutters, cornicing, ceiling rose and two shelved alcoves. The main focal point of the Lounge is the coal fire. 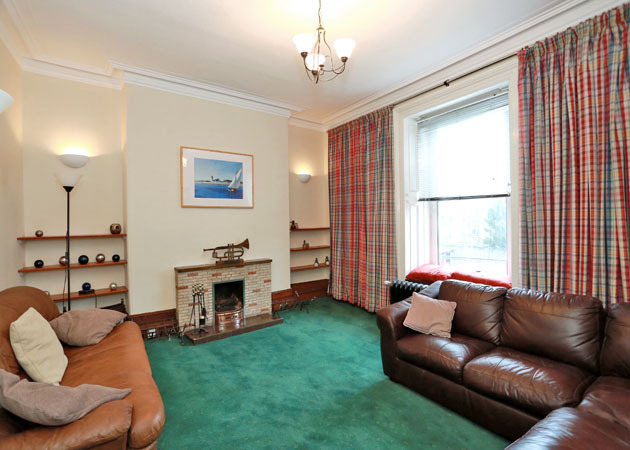 Fitted carpet and feature large cast iron radiator. DINING KITCHEN: 15’10” x 10’5” approx. 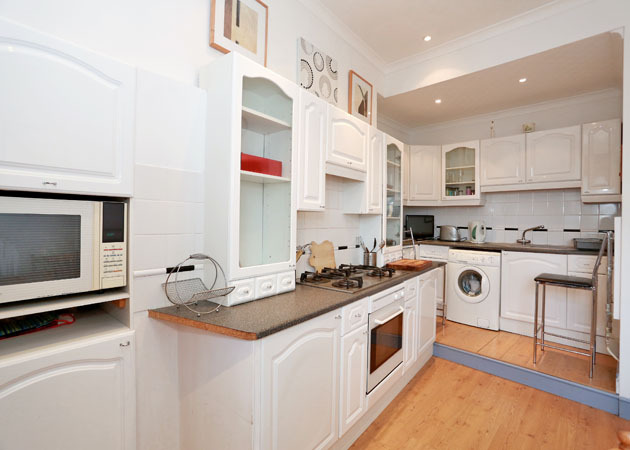 The Kitchen has been fitted with a range of white wooden base and wall units with co-ordinating work surfaces and is split with a raised level area. Integrated appliances such as the Electric Oven, Gas Hob, Fridge, Freezer and Washing Machine are all to be included within the sale. 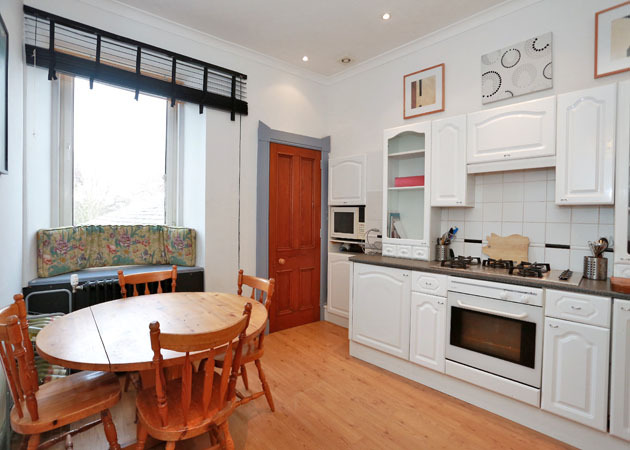 Plentiful space for dining. Laminate flooring, under unit lighting and glass fronted display cabinets. Built in cupboard housing the gas boiler. DOUBLE BEDROOM: 13’8” x 11’10” approx. 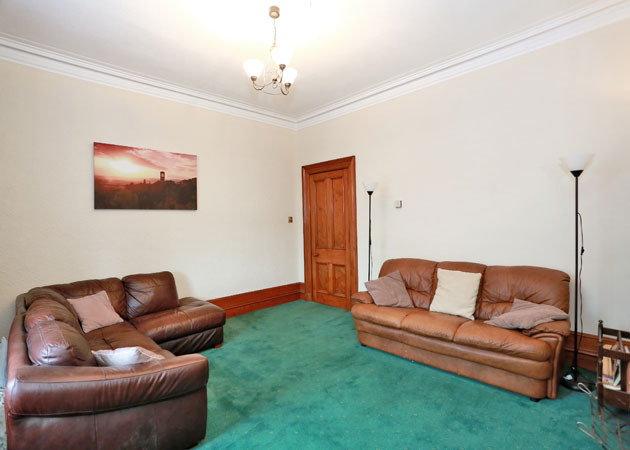 Spacious Double Bedroom to the front offering space for various free standing furnishings. 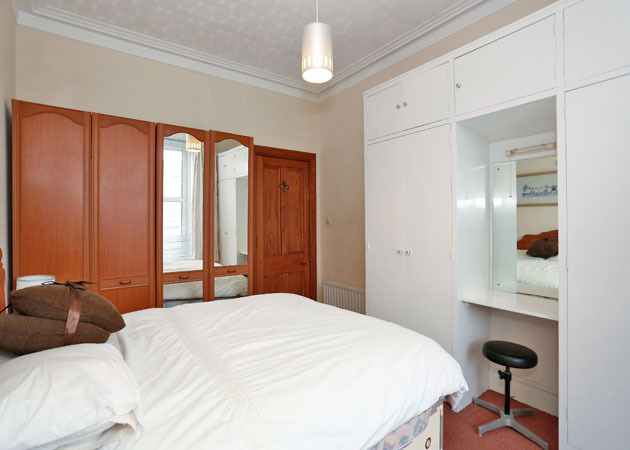 Fitted wardrobes offering ample shelf and hanging space. Further fitted wardrobes and cupboard offering shelved storage space. Fitted carpet. DOUBLE BEDROOM: 13’4” x 11’10” approx. 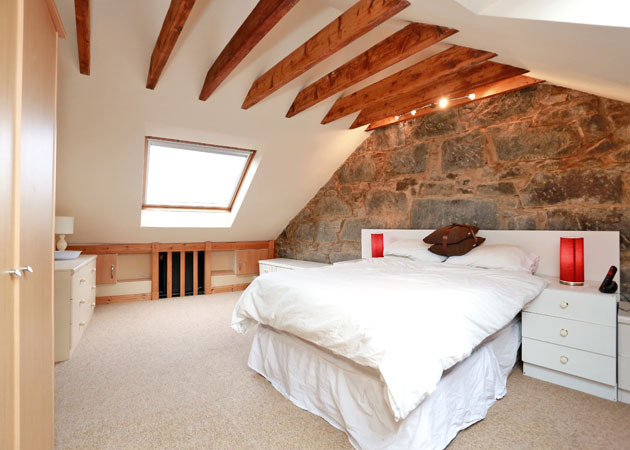 Double Bedroom to the rear of the property overlooking the garden area finished in a neutral décor. Storage cupboard. Fitted carpet. CLOAKROOM: Cloakroom w.c. located off from the second level stairwell. Fitted with a white w.c. and wash hand basin. Tiled flooring. 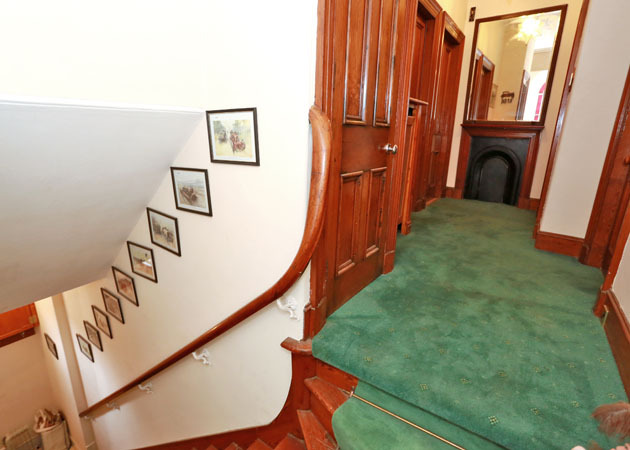 UPPER HALLWAY: Carpeted stairwell leading to upper level with Hallway providing access to all accommodation. Velux window with fitted blind. DOUBLE BEDROOM: 19’7” x 12’5” approx. 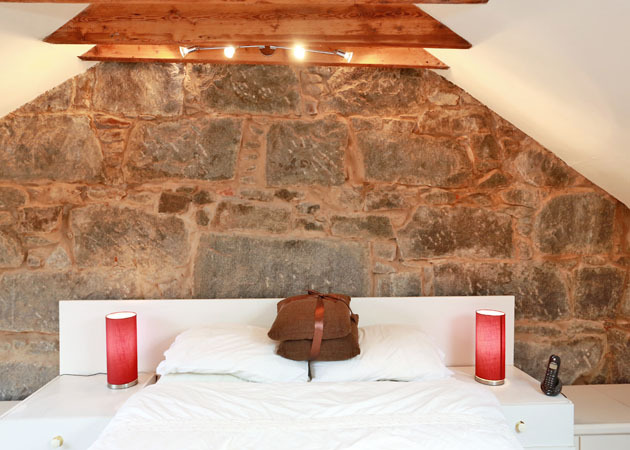 Bright spacious Double Bedroom with impressive features such as the exposed stone wall and wooden beaming. Fitted storage cupboards. Two Velux windows both with fitted blinds. Fitted carpet. SINGLE BEDROOM: 9’11” x 8’11” approx. 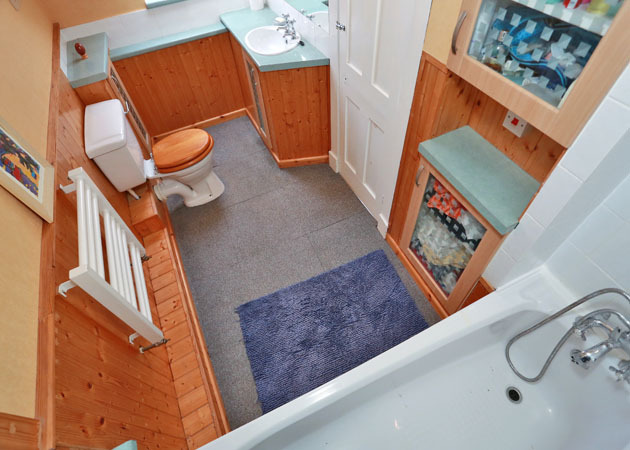 Single Bedroom with fitted storage facilities. 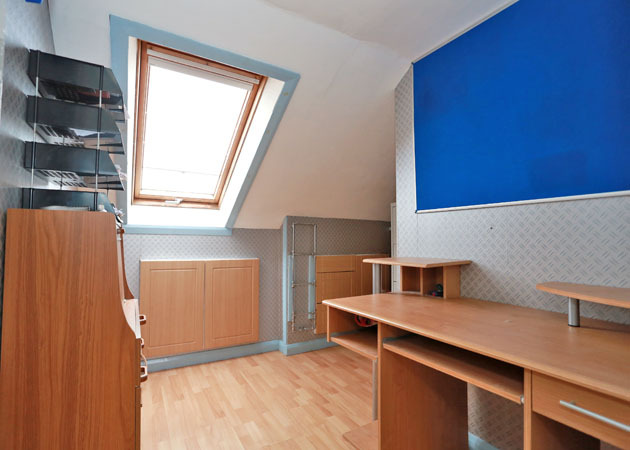 The room would also make the ideal study or children’s bedroom. BATHROOM: 11’9” x 5” approx. 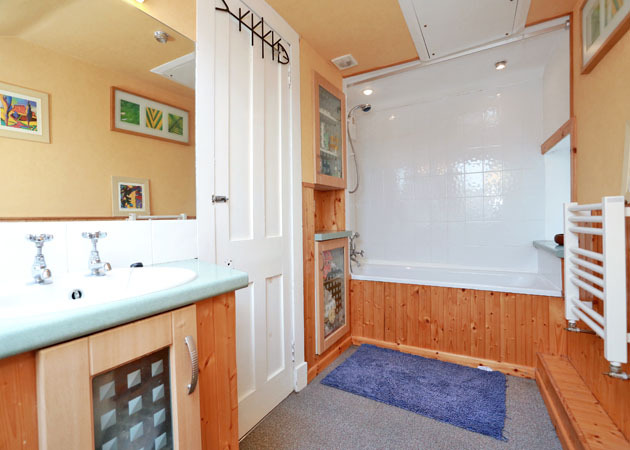 Bathroom fitted with white suite comprising a w.c., wash hand basin and electric shower over bath. 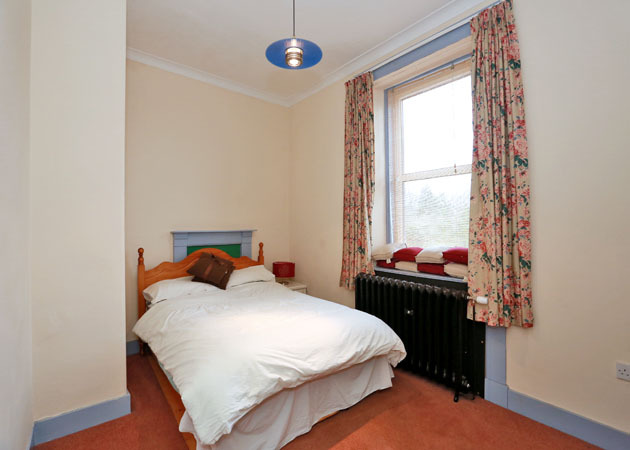 Large mirror with overhead light, heated towel rail. Neutral décor throughout. Carpet tiled flooring. GARDEN: Shared Rear Garden primarily laid to lawn. Private storage sheds with one being particularly long fitted with both power and light. GARAGE: Spacious Single Garage with automatic remote control door offering plentiful space for both a vehicle and further storage. The garage is fitted with both power and light.